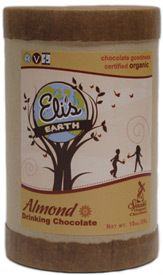 Eli’s Earth Organic Drinking Chocolate is the new way to enjoy a smooth, rich and creamy mug of hot chocolate any time you’d like. Made with certified fair-trade organic chocolate, Eli’s Earth also donates 5% of sales to non-profits that benefit children. Available in Classic Milk-Style or Dark Chocolate. 10 oz. (280g) containers are $11.99. Adult taste because it's not sweet. Very subtle taste. I ordered the milk-style flavor. I add a spoon of this with a sweetened cocoa and my drink is perfect.